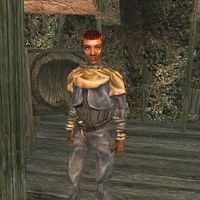 Dandsa is a Redguard warrior who was captured by raiders and is being held captive in the cave of Abernanit, near Gnaar Mok. You may be sent to rescue her by Radd Hard-Heart of the Imperial Legion. She wears a common shirt with matching pants and shoes and a leveled ring. Despite the fact that she is being held captive, she can be found carrying an iron broadsword. Like all Redguards, she has a natural resistance to poison and disease, and can boost her health, strength, agility and endurance for a short period of time; otherwise she knows no spells. "Are you here to rescue me? Do you want to travel together back to the cave entrance?" "Do you want me to follow you back outside this cave?" Follow me: "Get me outside this cave, %PCName." Wait here: "Okay. I'll stay right here until you come and get me." After being rescued, Dandsa disappears from the game. This page was last modified on 25 August 2016, at 19:30.